Now chocolate lovers have an extra excuse to enjoy their favorite treat. According to an analysis of past research, eating chocolate may lower the risk of having a stroke. 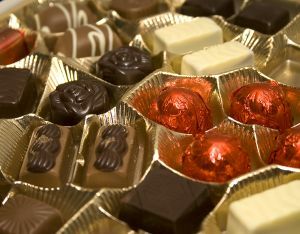 The analysis reviewed the only three studies on the relationship between chocolate and stroke. One study, involving 44,489 participants, found that people who eat one serving of chocolate once a week are 22 percent less likely to get a stroke than those who don’t eat chocolate. Another study, with 1,169 participants, found that people who eat 50 grams (1.76 oz.) of chocolate per week are 46 percent less likely to die after a stroke than those who don’t eat chocolate. Chocolate is rich in antioxidants called flavonoids, but research is yet to show whether they have a protective effect against stroke. “More research is needed to determine whether chocolate truly lowers stroke risk, or whether healthier people are simply more likely to eat chocolate than others,” said one of the two study authors, Sarah Sahib, BScCA, with McMaster University in Hamilton Canada, in a press release. The researchers will present their analysis at the American Academy of Neurology’s 62nd Annual Meeting in Toronto from April 10 to 17.